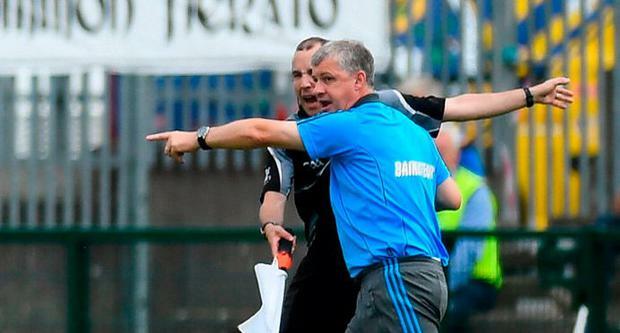 Roscommon boss Kevin McStay could face disciplinary action for putting his hands on linesman Niall Cullen after a decision went against his side just before half time in their 0-20 to 0-13 loss to Donegal. Footage also shows McStay throwing a ball that struck the linesman on the head but he insists that this was purely accidental. He apologised to the officials at half time, where he says he was asked to take a back seat. He sat in a chair along the sideline for the second half. Speaking on Independent.ie's GAA podcast The Throw In, Colm Keys says he feels McStay will be punished for his actions. "I think he will be in trouble. Obviously the precedent has been set with Diarmuid Connolly last year," said the Irish Independent's Keys. "I would suggest that Kevin McStay's was a little bit less aggressive but still he put a hand on. "It's minor physical interference and I would be very surprised if he avoids a ban. "There was also the ball throwing incident. He threw it up high, it hit the linesman on the back of the head. "I can understand his frustration when you look at the two frees. "Under the rules of the game it was a free. A clear free in to Roscommon. Your team is four or five points down at that stage and it's just coming up to half time and you don't get the free and it's a free out. "Kevin was obviously deeply frustrated but that doesn't excuse what happened after that. You must retain your control even if you know you have right on your side." Super 8s standings and permutations: Who will join Dublin and Galway in the semi-finals?